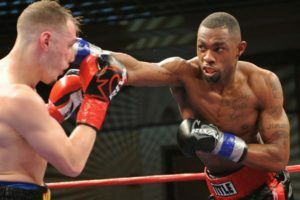 It took Jimmy Williams less than 4 rounds to decisively come through the biggest test of his burgeoning boxing career. A powerful Williams’ right hand sent Issouf Kinda crashing to the canvas, definitively ending the fight. Kinda who has been in the ring with the likes of Ismael Barroso, represented a significant step up in class for Williams, a step up that Williams handled with ease. “It was a huge win in my career and Kinda was a great step up fight for me” said the 30 year old Connecticut native. Fighting in a packed welterweight division, opponents are readily available. The likes of Carson Jones and Brandon Rios offer potentially mouthwatering domestic clashes down the road. Williams returns to action against Juan Rodriguez on September 16th, a date which coincidentally happens to be his birthday. When asked about his thoughts on his upcoming fight Williams was measured in his response, “Rodrgiuez is a tough fighter who has been in the ring with some world ranked welterweights, but I’m definitely ready to make a statement”. Once a promising college football player who was entered into the NFL draft; Williams’ story is both incredible and deeply moving. After his mother was murdered in 2008, he returned to boxing in her honor. Since then, Williams has gone from strength to strength. 14 wins and 1 draw later, Williams is on the verge of greatness. There is a palpable anticipatory buzz that reverberates around the Twin River casino in Providence, Rhode Island. Jimmy Burchfield’s Classic Entertainment Sports has put on an enthralling undercard that has provided the hungry fans with the knockouts and drama that they craved. But that was just the appetizer. There is a WBC national welterweight title to be decided. Jimmy Williams marches to the ring. The man from Conneticut is on enemy turf. His opponent, Nick Delomba hails from Cranston, Rhode Island, just a 20 minute drive from the Twin River event center. However, the boisterous army of loyal fans that have made the trip to support Williams eliminate any advantage that Delomba holds. In the opening salvos of the fight, a fierce combination by Williams knocks Delomba to the canvas. The crowd gets excitedly louder as they sense that a stoppage is imminent. Somehow, Delomba survives the first round. 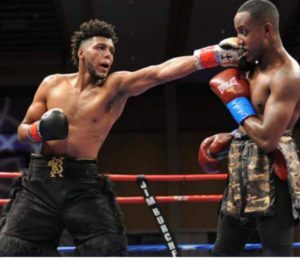 However, Williams had asserted his dominance and over the next 9 rounds he puts on an exhibition to win a unanimous decision, in the process taking the WBC and USNBC national titles. Williams’ story is as inspiring as it is unique. His uncle first introduced him to boxing at age 9. However, boxing was replaced when Williams discovered is talent for football in high school. His accomplishments on the football field earned him a scholarship to Connecticut State University where he played cornerback. After a great collegiate career, Williams began to eye the big leagues and had several workouts with NFL teams. In 2008, tragedy struck when his mother was murdered. He was in a football meeting at Southern Connecticut when his sister called to give him the devastating news. Inspired by his mother’s death, Williams returned to the sport, “she always told me I would be a boxer” he says. He went back to the gym and had three amateur fights before he turned pro, “I channeled all the anger and pain into the ring” he says, “boxing gives me hope”. He moved quickly through the ranks, having 6 fights in his first 10 months as a pro. In 2013, he signed with Jimmy Burchfield and Classic Entertainment Sports. This was the catalyst that took his career to the next level, “CES has been doing a great job with my career” he says. 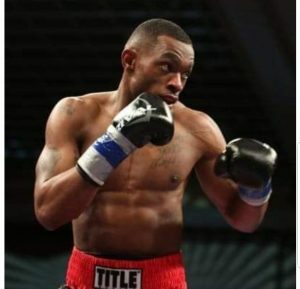 Since signing with Burchfield, Williams has fought on NBC, ESPN and has picked up two titles. One can’t help but notice the army of fans that follow him to his fights. His following that includes former college teammates and friends and family comprises what is one of the loudest and most loyal fan bases at this level. “My fans mean a lot to me” says Williams, “they know my story and understand my pain, they are the storm”. He is grateful for their support and he says he hopes to have his next fight in Connecticut to repay them. When pushed for his future ambitions, Williams doesn’t shy away: “I’m going keep on coming until I get to the top and become a world champion, that’s the ultimate goal” he says. This goal isn’t some pipe dream, he is well on his way. The welterweight division his stacked with talent, Manny Pacquiao, Errol Spence and Kell Brook to name just a few, but many of the big names are coming to the end of their careers. Perhaps then, Williams is arriving at the opportune moment. His god given talent and work ethic are unquestionable. If he didn’t already have enough motivation, the soon to be father of two now has to use boxing to provide for his children making him all the more driven and dangerous. Combine that with his fast hands and punching power and you have a deadly cocktail that make Williams a fearsome prospect to anyone. If the welterweight division thought it was getting some respite as the top names retire or move up, it was very wrong. The quiet storm is quickly becoming a hurricane. Sat there in the crowd at the Twin River events center watching Williams lift the green and gold belt above his head, it is clear this is about more than just boxing. The belt doesn’t just represent a championship, it signifies a much more personal victory. The struggle with adversity is all too familiar for the 30 year old fighter. Boxing has helped him win his fight away from the ring too. The emotion etched into his face as he stands triumphantly in the ring tells those in attendance what he already knows, he has made his mother proud.